It's funny that Sardonyx is among the most anciently used of stones, but yet it can look completely modern and stylish. 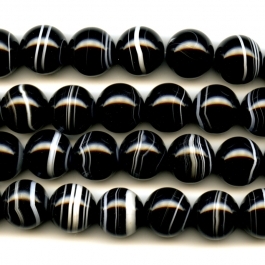 Well, that is the definition of "classic," which accurately describes our Sardonyx beads. Sardonyx is actually a variety of onyx, with "sard" interpreted as red striped — Get it? 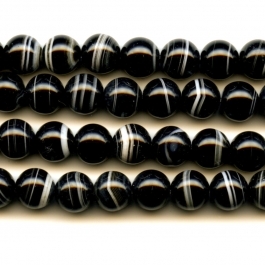 Striped onyx! The stripes are white chalcedony, or quartz. 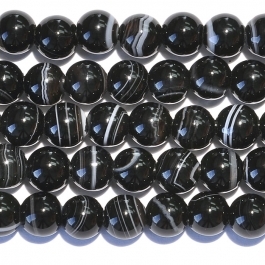 Onyx is often dyed — the black onyx you see so often is still colored using a recipe that dates back to ancient Rome. 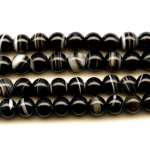 These beads, with their striking white bands, indicate the stone is natural. However, it has been heated to emphasize its colors. Remember, with our new beads, what you see is what you get. You can count on them being the same quality and color as pictured above. Sardonyx was a favorite of ancient Greeks and Romans, who believed it could bring courage and victory. The richly colored stone was often engraved with images of war-like gods — think Ares, Hercules, or Mars — and carried into battle by soldiers who believed they would become as brave as the figures carved on these talismans. 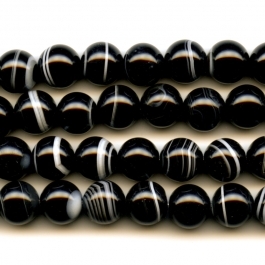 Today, these timeless and elegant Sardonyx beads will add elegance to anything you create with them. Learn about the colorful history of Onyx and Sardonyx in a post on our Wire-Sculpture jewelry making blog. Click here to go to "Gem Profile: Onyx." Wire-Sculpture's new line of beads reflects the highest quality available on the web. Every stone is useable, so there's less waste; plus, you'll immediately notice the unusual excellence in cutting, drilling and polish. We're here to help you with any questions about jewelry supplies or tools; just give us a call at 1-877-636-0608 (toll-free).